Posted 28 January 2019 by ailsadunn & filed under Uncategorized. Tigers, monkeys and dragons roared in Hay School on Sunday 27th January. But there was no cause for concern. 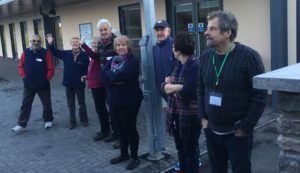 Rather , there was much laughter and audience-participation as The Hay Theatre Group entertained visitors from Swansea, alongside friends and supporters of Hay Brecon and Talgarth Sanctuary for Refugees [HBTSR] with their production: of ‘Telling Tales’. These folk tales from Asia and from Wales provided the opportunity for drama , music and dance. The animal roars of children were quite awesome and their enthusiastic participation in the dancing was a joy to behold. In all, 150 people (including our own supporters) enjoyed this day as staff, pupils and parents joined with local community groups to provide generous hospitality to our visitors from Swansea. The day began when the coach from Swansea, driven by ‘our own lovely’ Stuart, arrived shortly before noon and its occupants disembarked into the bright, crisp air of Hay-on-Wye. Hot drinks and a copious supply of cakes, dates and biscuits provided a warm welcome before the more energetic visitors headed off for a walk, led by Gez, into the neighbouring countryside. They were clearly intrigued to have an international boundary pointed out to them in the midst of the Welsh countryside; the Wye tributary that marks the boundary between Wales and England. Philip, Mrs B and Adil welcoming people, the facepainting, tattoos and drawing. Meanwhile, the children were all busy with various art and craft work, so ably provided by parents and friends of Hay School, and having their faces painted and arms ‘tattoo-ed’. It was truly wonderful to see local children mixing happily with those from many nations with backgrounds very different to their own. Play has no boundaries. Lunch was, as ever, a generous affair with plenty of hot (vegetarian) food, followed by fruit and cakes, thanks to the generosity of so many people in Hay and its surrounds. Then came the theatre. The dining room was swiftly transformed into an auditorium, complete with scenery and stage lighting, and all – young and old alike – settled down expectantly. The Hay Theatre Group provided a real treat of entertainment, involving everyone in the process. Monkeys exhibited their cheeky mischief; tigers and other animals struggled to co-exist with human beings and the baby green dragon grew before our eyes into a fearsome monster – before morphing into a landmark: the Dragon’s Back. Josh and Melrose sorting some of the donations, Sean arriving with a car boot of donations from Jasper, The bags packed ready to leave. Time, then, for ‘afternoon tea’ – with more cake – before fond farewells as our guests climbed once more into the ‘Bluebird’ coach. 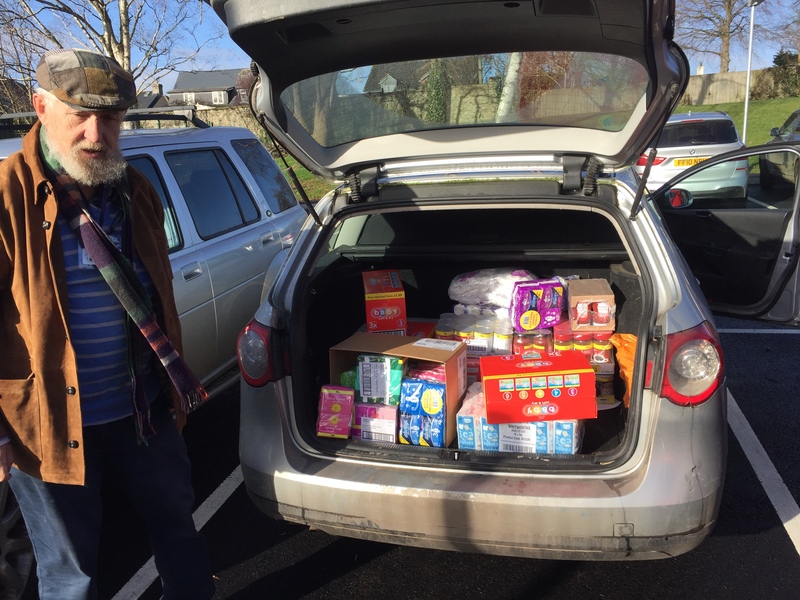 Another great ‘Respite Day’ ended with lots of waving as our visitors departed for Swansea, accompanied by a boot-load of food and toiletries not only for themselves but also for the other refugees and asylum seekers served by UID and SASS. Lawrence and Philip with the pile of bags and some of the ‘workers’ waving goodbye. Such days do not happen by accident but by the hard work, planning and generosity of so many. So our thanks go to Headteacher Alexine Bartholomew [Mrs B. or Lex] Claire and her team of helpers [Sue, Melrose, Lynne, Ailsa, Sarah and Christina] , the staff, PTFA and pupils of Hay School, Berni from the market stall, Ellie of the Three Tuns, Hannah of The Old Electric , Aine from Hay Festival, Jasper Fforde and members of the Hay Chamber of Commerce, in particular Josh Green, Derek Glashan from Hay Deli, Zoe McLean from A-Z, and Sally Forward from Mostly Maps. The Hay Theatre group and Janine. I’d really like to thank everyone who came and helped and who made the day so good. Bernie Herman – she brought food but more importantly stayed and managed the kitchen – a total star who made a huge difference to the day! Joshua Green from the Chamber of Commerce. He promoted the day and coordinated offers of help and food. And delivered it at the time it was needed! Ellie from The Three Tuns and her staff. Derek at Hay Deli donated lots of food and toiletries. And huge huge thanks to Alexine Bartholomew from the school who coordinated everything to make it a community event….plus the PTFA whose help on the day was magnificent. Thanks to all members of group and members of public for organising another amazing day in Hay. Kids and adults had so much fun. Most importantly the public involvement seem to be even higher than usual, which is amazing. And Big Thank to the Theatre team for their show. At this end, we see the difference that your group makes, knowing that there is an undercurrent of support empowers us to help people that otherwise would not be helped. I cannot emphasise this enough. Maria Volunteer from Swansea. © 2019 Hay, Brecon and Talgarth Sanctuary for Refugees. Hay, Brecon and Talgarth Sanctuary for Refugees is part of the City of Sanctuary Network, a movement spread throughout the United Kingdom and Republic of Ireland, committed to building a culture of hospitality and welcome, especially for refugees seeking sanctuary from war and persecution. Contact Hay, Brecon and Talgarth Sanctuary for Refugees.